Executive Protection Unit Detective Gerald Coleman and Gov. Paul LePage help unload food donated by Occupy Augusta, a political group that protests corporate greed and other issues. Gov. 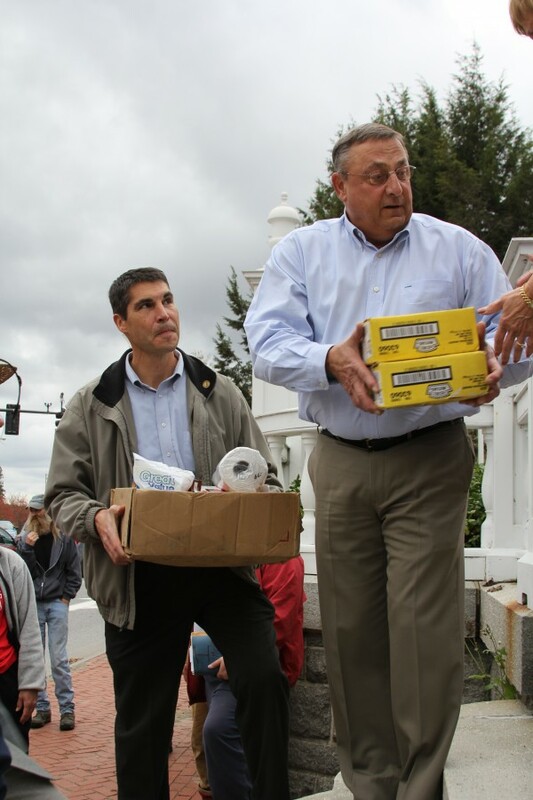 Paul LePage held a food drive on Saturday, Oct. 22, at the Blaine House in Augusta. AUGUSTA, Maine — People of different ages and political beliefs went to the Blaine House on Saturday afternoon to give to a common cause: Maine’s hungry. Even the political group Occupy Augusta, which has about 30 people camping a stone’s throw from the governor’s home, stopped by for Gov. Paul LePage’s food drive Saturday. The group, which protests corporate greed and excessive individual wealth, among other things, receives food donations from supporters. As of Saturday, the group had too much food so members brought some nonperishable items to the governor’s food drive. “Politics aside we want to make sure people who need food get it,” said Occupy Augusta member Paul McCarrier of Rockland. As the group marched down the street, the governor’s security all moved toward the entry gate. “We’re coming to give the food. That’s it,” McCarrier said, standing outside the Blaine House gate dressed in camouflage. “We can come together for a common cause here. It’s good,” said LePage’s press secretary Adrienne Bennett said from the other side of the fence. LePage came out to help Occupy Augusta unload the food and group members took the chance to tell the governor what they are protesting. After one Occupy member read the group’s beliefs off a notecard, LePage nodded. “Some of the points you bring up I agree with,” LePage told the group. For instance, he said, they both agree that U.S. jobs shouldn’t be shipped overseas. “Thank you all,” he told the group as he shook each member’s hand before heading back inside. Inside the home, people from all over the state dropped in to say hello and to bring food. Some people were a bit star-struck. “He is my hero,” Paul Moulton whispered to first lady Ann LePage. He shook the governor’s hand Saturday. “Everyone I know is cheering for you,” Moulton told LePage. In the dining room of the historic home, Ben Twitchell of Winslow sipped coffee and looked through the home. “It’s great to be able to walk up to the governor and shake his hand,” Twitchell said. His wife, Linda Twitchell, even got an autograph for their 7-year-old granddaughter. The couple brought muffin mix, soup and canned tomatoes for the food drive. “There’s a lot of people in the state of Maine who don’t have enough food,” Linda Twitchell said. “People who can do something to help should,” Ben Twitchell said. 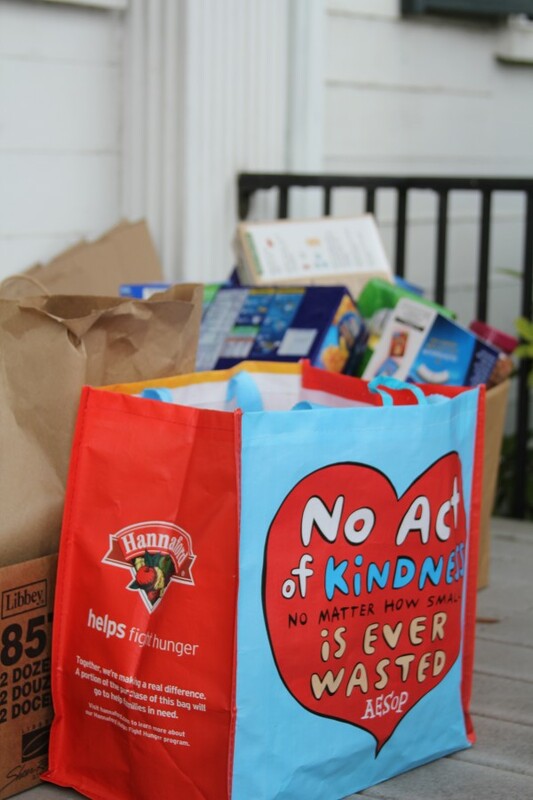 The food drive will continue for two more Saturdays, 11 a.m.-2 p.m. Oct 29 and Nov. 5. The food then will be given to homeless shelters, but it’s not clear which ones yet. According to Bennett, LePage’s staff will research which shelters need the food the most. “We’ll drive to Washington County if we have to — wherever the need is,” she said. Now is a particularly important time to give, she said.